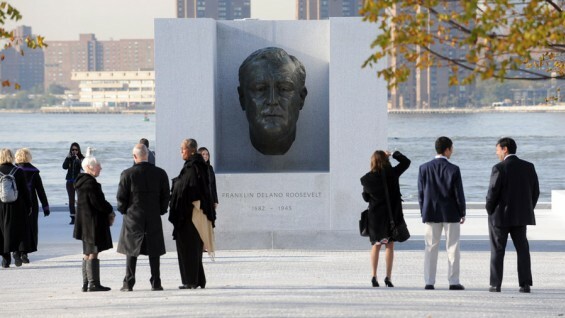 On the beautiful Wednesday morning of October 17, 2012, a ribbon-cutting ceremony marked the long-delayed completion of Four Freedoms Park, a public memorial park for Franklin D. Roosevelt on the southern tip of Roosevelt Island. Cooper Union had its own representation there thanks in part to its catalytic role in reviving interest in the project. Along with the dignitaries, including President Bill Clinton, Governor Andrew Cuomo and Mayor Michael Bloomberg were alumna Gina Pollara (AR’91), Executive Director of The Four Freedoms Park, Elizabeth O’Donnell (AR’83), Associate Dean of The Irwin S. Chanin School of Architecture, and Steven Hillyer (AR’90), Director of The Irwin S. Chanin Architecture Archive. Associate Dean O'Donnell describes the memorial as "a beautiful, significant work of architecture and an incredibly important new civic space in New York. It marks a new center in the city and demonstrates how architecture can both embody and effect our highest aspirations of citizenship." 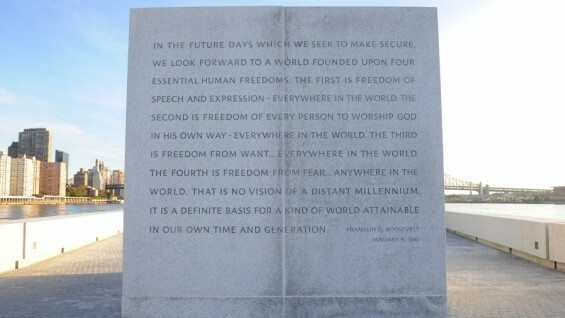 Steven Hillyer adds that "the realization of a memorial to Franklin Delano Roosevelt in New York has been long overdue." It almost didn’t happen. The history of the park dates back to 1972, when the Franklin D. Roosevelt Foundation first commissioned famed architect Louis I. Kahn to design the memorial site on what was then known as Welfare Island. Kahn completed the plans but died suddenly in 1974. Then, faced with the threat of imminent bankruptcy and a collapsing economy the mid 1970s, the city of New York postponed building the memorial park indefinitely. Nearly four decades would pass before Kahn’s plans to honor Roosevelt would finally be realized, in part because of a key Cooper Union exhibition about the design. In 2004 Jane Gregory Rubin, Secretary of the Reed Foundation, suggested an exhibition of Kahn’s plans to Elizabeth O’Donnell. The goal was to renew interest in building the neglected monument and buttress Roosevelt’s legacy before the last generation that could remember him in office during their lifetime disappeared. “[It was] nearly forty years after the plans were first created,” says O’Donnell, recollecting the idea for the exhibit. “There were still New Yorkers remaining who could remember hearing FDR's voice on the radio. This project was either going to happen now it or it wasn’t going to happen at all. Jane understood that an exhibition like this could jump-start renewed interest in the construction of the memorial,” O’Donnell says. To realize the exhibition the School of Architecture visited the Kahn Archive at the University of Pennsylvania, and conducted substantial original research on Kahn’s plans for the unbuilt project. Original digital renderings of what the park would look like on the island today were also commissioned, allowing visitors to more vividly imagine the memorial as a present fact rather than a historical curiosity. 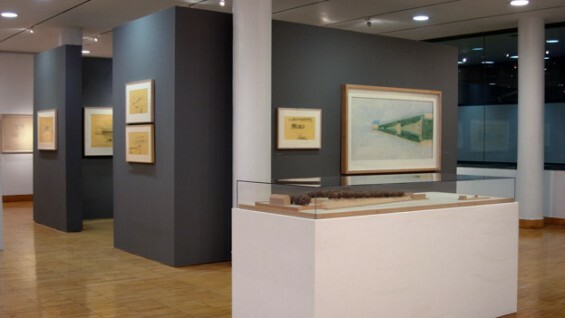 Installed in January 2005, the show attracted the attention of the press and interested philanthropists. Writing on the show in the New York Times, architecture reporter Julie V. Iovine described the memorial as a series of “framed views of the harbor and skyline with the simple but stirring monumentality of a Greek temple.” In her piece on the exhibition, Iovine also quotes Nathaniel Kahn, the architect’s son and director of the celebrated documentary film My Architect, saying that "of all the unbuilt projects, this is the one that really could be done, and now, more than ever, should be done." The exhibit fulfilled its original purpose, sparking renewed interest in the park. Iovine’s article in the New York Times helped result in several charitable foundations reaching out to the city in support of the building of the park. "I felt immense pride that The Cooper Union, given its history of support for democratic principles and social justice, had been so instrumental in the Park's realization," O'Donnell said shortly after the ribbon cutting ceremony. "As it has so often in its history, because of its vision and passion, our small school made a great contribution to the life and architecture of New York City." Now, nearly eight years later, the park finally opens to the public on October 24, 2012.